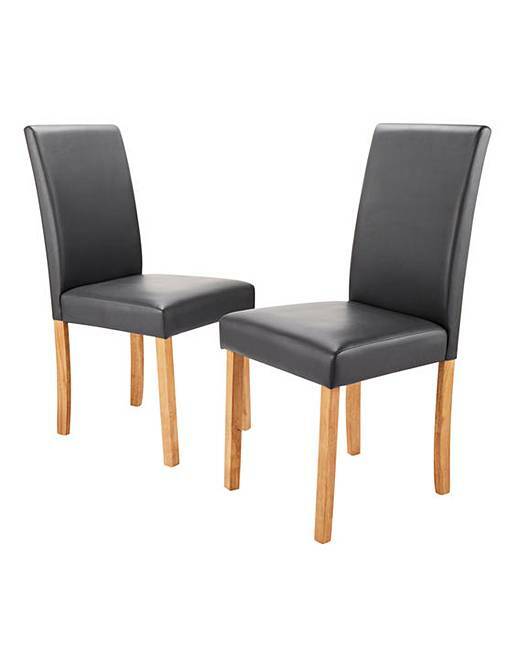 Mia Faux Leather Pair of Dining Chairs is rated 3.5 out of 5 by 4. Classic dining room chairs, upholstered in a hardwearing faux leather. Coordinates perfectly with our dining tables - Oakham oak veneer dining table range, Oakham glass panel oak veneer dining table range or Albany dining table range. H.88 x W.43 x D.57cm. Seat height from floor 50cm. Rated 3 out of 5 by Jacky from Nice chairs I bought these chairs a few weeks ago, they are nice chairs but not what I wanted. I found that the seat was too narrow and felt like there wasn’t enough seating area. The back of the chairs were too low for me, overall the chairs seemed a little small ( I am an average size person). Although theses chairs were not right for me they may work for someone else. Rated 2 out of 5 by CANTY from Look good but fiddly to put together Delivery was great and these chairs are inexpensive. However, assembly took a while with a lot of unscrewing and readjusting. I have built a lot of flat pack furniture, and this was naot complex but was very fiddly. Some of the wood on the base was a bit split but hopefully this won't affect use. The visual instructions don't match the written codes for the washers/screws so take care when assembling. I blew up the picture on my iPad so I could see which washers to put where. A bit disappointed as they're not quite level on the floor - this may settle with use - and I'm not sure I'd trust them with a heavier adult. Rated 5 out of 5 by Poppy from Great quality I wanted two comfy chairs for my dinning table. Excellent quality and every thing l wanted. They look great.